Sanjay Kishore (Trinity ’13) became interested in issues of investment responsibility after spearheading a 2011-2012 movement against conflict-minerals on campus. 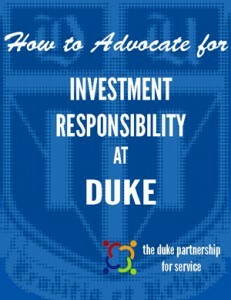 In this 34-page pamphlet, he describes the history of activism on Duke’s campus and lays the foundation for how a student might challenge the investment decisions for the Duke Endowment as one way of championing social justice and change. Click the toolkit to read more.